This is the seventh and final article in a series detailing the 684 kilometre Route des Grandes Alpes. A great cyclo-tourist route through the French Alps, over 16 mountain passes, on a road linking Lake Geneva (Lac Léman) to the Mediterranean Sea. The main goal of these articles is to highlight alternate route options and interesting detours. One of the reasons I wrote this series was for this stage. Unlike the other 6 stages, I do NOT know this region, and thus will use this post as a plan for some rides (hopefully) this year. I’m grateful to friend Tim, who knows the region very well, and has provided a couple of very interesting sounding alternatives to the main route. Also thanks to friends Torsten and Ben for permission to use their photos – see below. Lots of climbing on this last stage with the reward of a nice beer beside the Mediterranean sea. 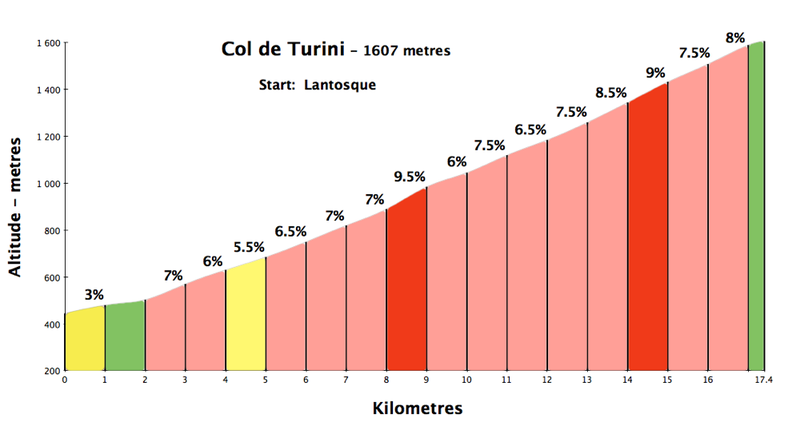 I’ve added profiles for the two big climbs of the day, first Col St. Martin, and then Col de Turini. After Col de Turini, the descent leads to the village of Sospel – with a nice little fountain/square it’s a perfect place for a lunch break. 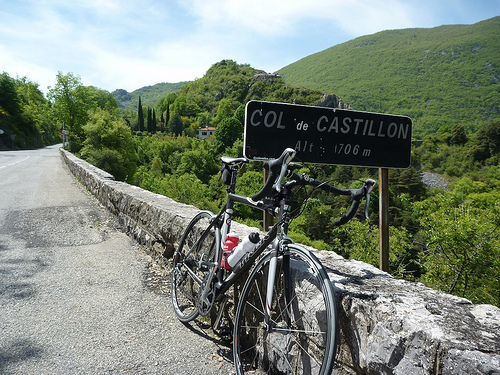 The route then climbs the easy side of Col de Castillon. The fun part of this climb is the descent. Well surfaced in a tight rocky valley, it’s a fast ride straight towards the sea. Finally, note the mapped route, has one final bump after reaching the sea, as it climbs the famous little corniche roads up to Col d’Eze (of Paris Nice fame). I was there years ago, sans vélo. A beautiful place. The two Detours below were both recommended to me by my friend Tim. 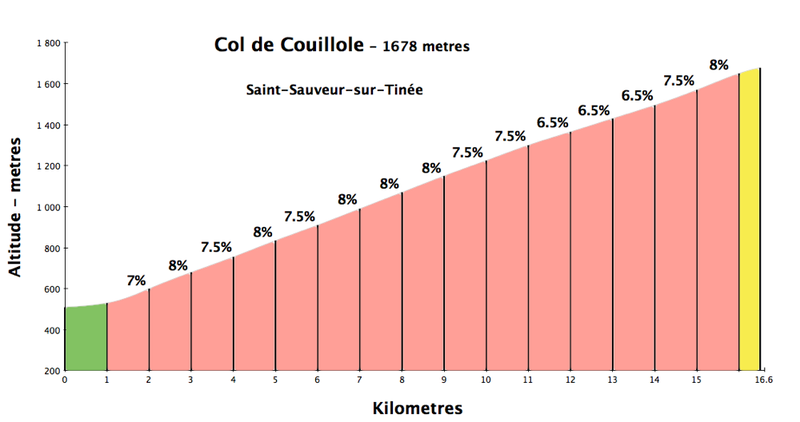 (The orange track on the map) – This alternate route begins by climbing Col de Couillole – a climb that has been praised and suggested to me many times. This doubles back on the official route from stage 6. Although, if you arrived in St-Sauveur via Col de Bonette then you skipped this great road. Here are a few Gorges du Cians photos taken by my friend Ben. (The pink track on the map) – This is just a scenic variation of the middle of the orange route. See here for some superb St. Raphaël photos from mon ami Bastien (great web site). 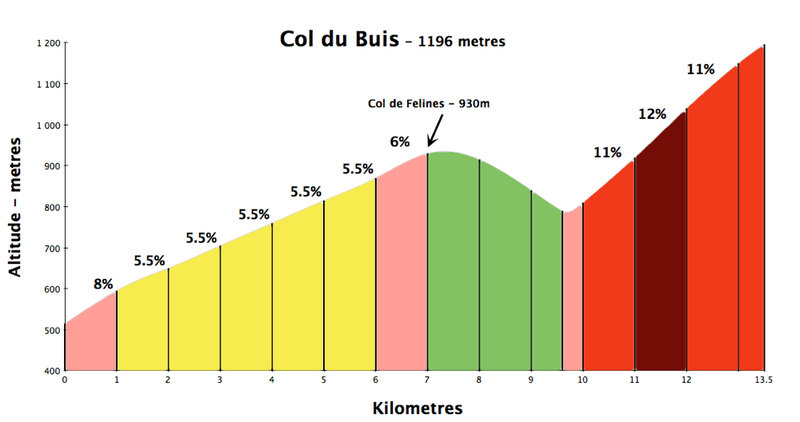 For the col hunters in the crowd, note: on the above profile, I have included the final two kilometres to Col Besseuges (marked on the map) – a small detour. I have ridden once in this area. 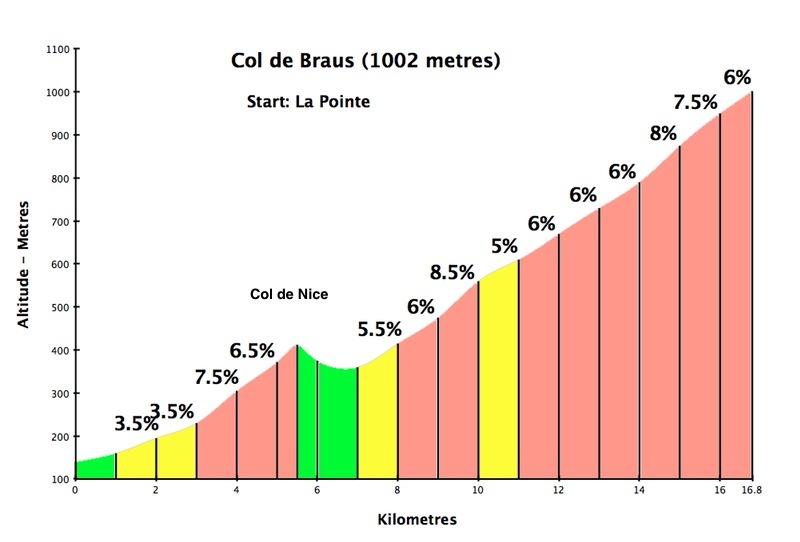 The purple loop on the map can be done from Nice and includes the superb hairpins of Col de Braus, Col de Chatillon, and inspiring views of the sea from Col de la Madone (that dog Armstrong’s favourite training climb). It’s an excellent route. Here is a short silly video from 6 years ago, that at least gives one a feel for the landscape. More ride details here. On the map, I have labeled cols with a star. The red stars are the climbs that interest me the most. In particular I am intrigued by the three dead end roads up against the Italian border, just after Col St. Martin: Le Boréon (1605 metres), Refuge de la Madone de Fenestre (1933 metres), and Vallon de La Gordolasque (1800 metres). All perhaps have unpaved options higher? Also Col de Tende far to the east is one of my prime unpaved targets for 2016 (hairpins!). When I get a chance, I’ll add profiles for these ideas. Please feel free to suggest in the comments any other favourite climbs you may have in the region. Thanks. Road Openings/Closures: We’re lower and further south here. Currently; in February, Turini is open – chains required for cars, but still. Official Col open/closed map here. I hope this series has been helpful. For me at least, it’s always motivating to spend the colder months staring at maps and brainstorming ride ideas. Excellent work, as always, Will. This series should help a lot of people with their planning, and you’ve covered almost every sensible/interesting alternative to the main route that doesn’t deviate too far away from it. 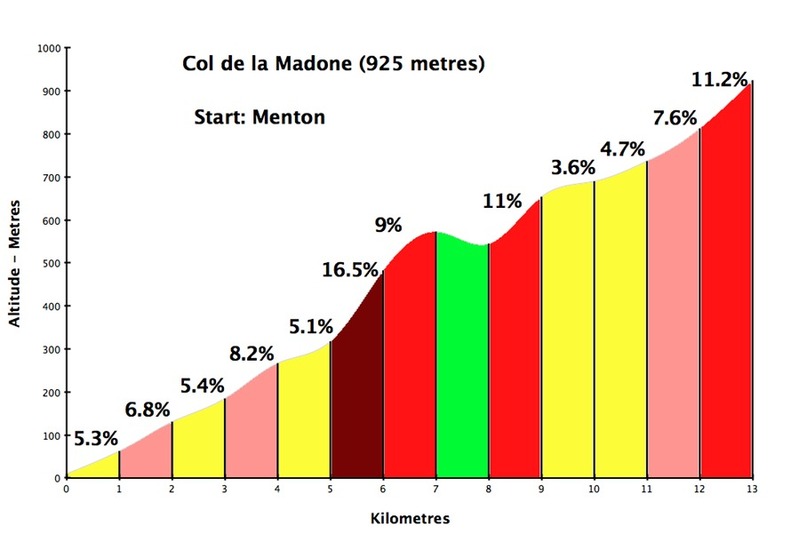 I’ll be looking forward to your Col de Tende report – it’s been on my list for a while but won’t be happening this year. North side of St. Martin and Turini are fine like descent. From summit of Turini is possible go higher to monument Authion and then along poor surfaced (but rideable on road bike) military loop road above 2000 metres! There are fine vieuws to Liguire and Maritimes Als and Two or so ancient forts. Nearby Turini are lot of small roads (especially around Lucéram). Nice and very twisty road is from Col de Able towards Les Cabanettes. It’s very hilly country. Great stretch is from Levans to Vesubie valley. There is parallel busy way through gorges Vesubie, but this one i more better – quit, scenic and impressive. Gorges du Cians. If You wold cicle this defilé don’t miss two short stretches closed to cars – Grand Clu and Petit Clue. I like area south of river Var. 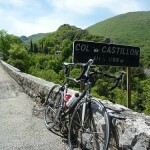 My favourite climb is for example Col du Trébuchet. Pleasant steepnest on tiny very quiet road through nice land scape. Then via Col du Felines is huge vieuw towards ancient Entrevaux. Fine road is from Col St. Raphael vi Ascros back to Var river. Anoher favourite road is from St. Auban via Col Pinpinier and next through small but very nice Clue Aiglun. You can continue along fine road D1 from Roquesteron to Bouyon and return to St. Auban via Gorges Greolieres and Col du Bleine. From summit of Bleine leads bad surfaced tiny road up the grass ridge with fine vieuws. It’s highest tarmac road in this location. Clue St. Auban, nice short gorge with chapel carved into the rock. Good tip is Col St. Barnabe too. There are two variant from Barrage Chaudanne and Barrage Castillon with vieuws to the lakes. Level road along Lac Castillon is nice too. Very quiet roads. Gran Canyon du Verdon. Little far from central Alps but you must visit this one. There are three roads around Canyon. Full version have 108 km and 2500 vam. Quite hilly. Between Verdon and more eastern Gorges du Loup are lot of small quiet road leading in typical farmer countryside. Zbynek, excellent. Many thanks for all the ideas. 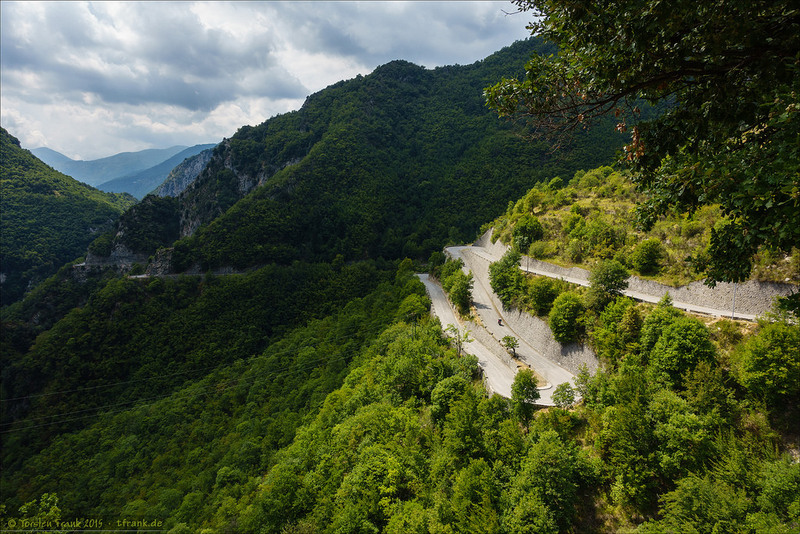 It has been a few years, but I remember the descent from Turini past Peïra-Cava toward col de l’Orme as one of the most fun roads anywhere – tight switchbacks where you get into a rhythm, like skiing a giant slalom. Not to be missed. I have ridden down this hairpin section in 2013 and absolutly agree. I have to agree with Thomas and Zbynek. Although I didn’t ride the specific section they did, I spent a day last summer based in Sospel riding up and down the Turini and various cols in the area: paradise for the hairpin-lover. To get them all in I took the south route up to Turini, then down via Peira-Cava to the Col St. Roch, picked up the small Cols de Savel and Portes, then down to Luceram and back up the mountain to the the junction with the road heading to Cols de l’Orme and Ablé and Braus. So many hairpins. 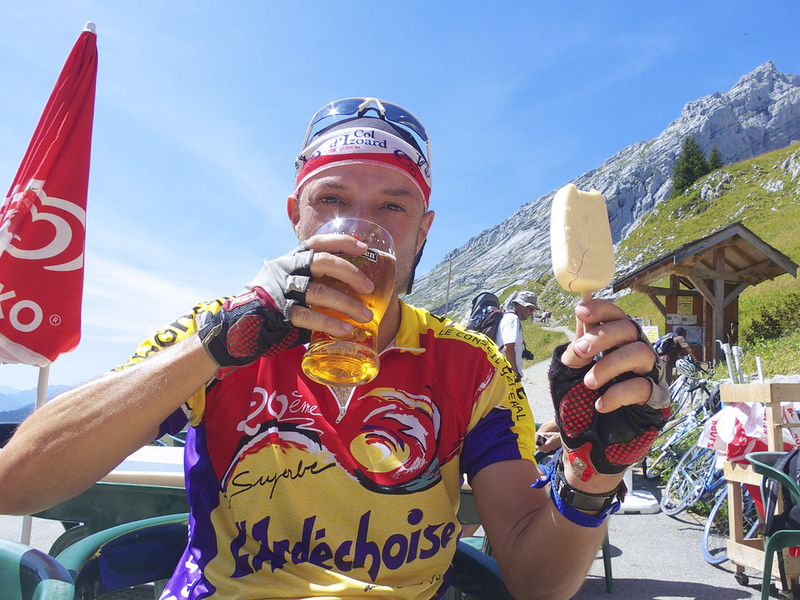 Hi Will like you I look for a challenge each year this year I did the Route des Grande Alpes over six days in August in was the best week of the year. I did the LEJOG two years ago, like you I’ve completed the Marmott twice (not very fast) . Anyway here’s the question there is a one day Sportive called the The Tour de Mt Blanc it’s one day 330km with over 8,000m of climbing over seven major cols. The one day event might be beyond me now as I don’t think i would make the cut off times but I’m tempted however I was thinking that a two day ride would be a good 2019 challenge. It would have to be July (not the 20th) or August I was wondering if you had any thoughts advice suggestions clockwise or anticlockwise ect. Ha, actually I’ve had this debate with friends and I actually have a strong opinion. 🙂 I think it is far better counter-clockwise. The biggest reason is Col du Grand St. Bernard. The Italian side is truly fantastic and you want to climb this side. The Swiss side is long, over 40 kms, but only the top 6 kms are great as it’s on the old road before the car-only tunnel. Thus the Swiss side can get a little traffic including trucks. Whereas the Italian side mainly avoids it as it takes a road around where the tunnel lets out. 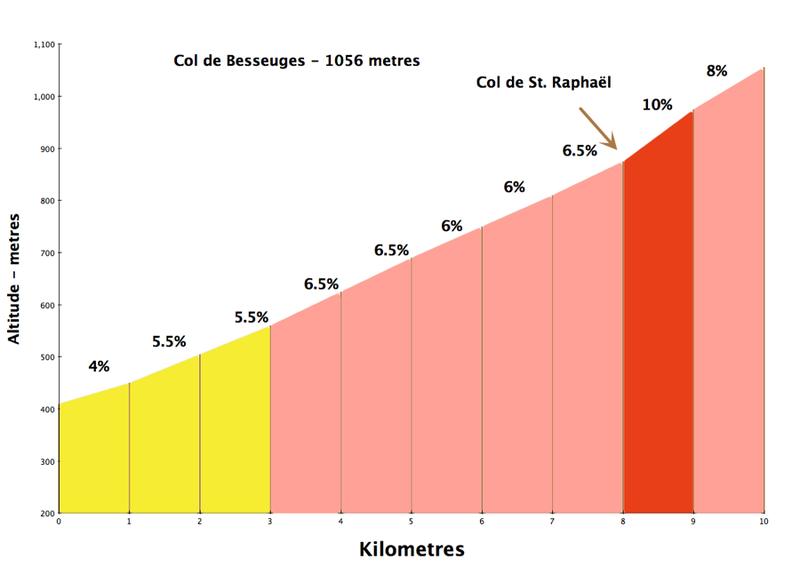 1) You climb Cormet de Roselend from the north. Via Col du Pré instead of directly up gives great views of the lac de Roselend and allows you to to ride over the dam. 2) the Italian side of Petit St. Bernard. At La Thuile you can head up and down Colle San Carlo. Far quieter and avoids the tunnels/avalanche things on lower slopes of Petit St : Bernard. Plus it will be in the 2019 Giro so perhaps interesting. 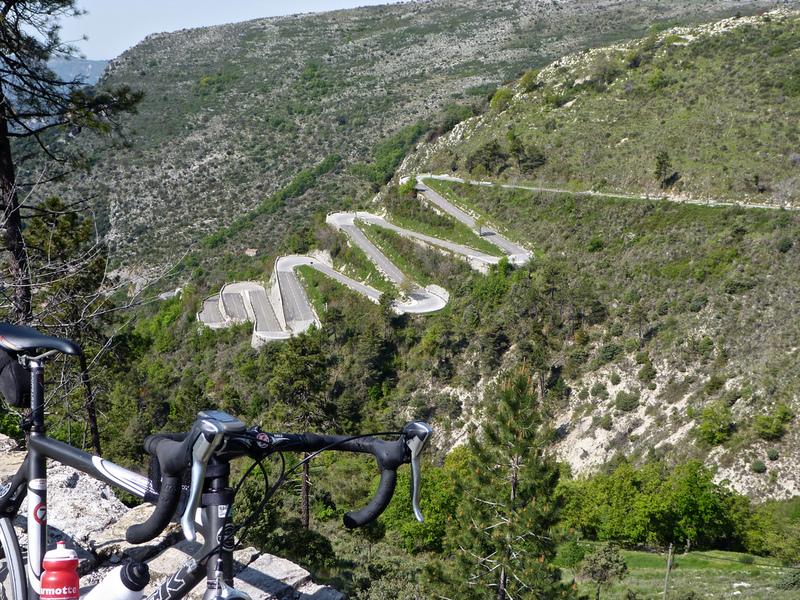 Stephen – I agree with Will about riding counter-clockwise, and about adding col du Pré and San Carlo (this one is a very nice climb from Morgex, in case you go clockwise…). I would take 3 days and do some add-ons. Or 4. Why rush it? bring a camera. – between Morgex and Aosta avoid the main road. From Morgex ride through la Salle, then back on the main road from Derby to Runnaz, then turn off to Avise, Cerellaz. You can climb to Vens and Colle Joux just above, a forgotten col at 1930m (last 200m are unpaved). Then stay above the main valley on SR41. – from Aosta ride on the east side of Valpelline through Roisan, then cross and climb to Ayez, Allein, Etroubles. From St Oyen turn down to the river to avoid the main road, then Cerellaz, and finally the old St Bernard road. 3) Martigny, Forclaz, Finhaut, Emosson, col des Montets, Chamonix, vaudagne, Passy, Domancy, Megève, Flumet, Alberville: 140km and 3700m. Then you have to consider weather. If it turns bad you’re not doing what’s planned. If it was me I’d just wing it with hotels instead of booking ahead. Usually the night before or in the morning you known the weather for the day, book then. It depends how comfortable you are with that, and also on the season.